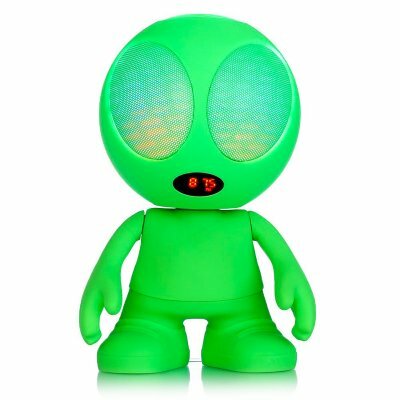 Successfully Added Portable LED Light Alien Bluetooth Speaker - Micor SD Slot, USB, Aux In, Hands Free, Caller ID, HSP, HFP, A2DP, AVRCP (Green) to your Shopping Cart. This cool, little green man, Bluetooth speaker looks like a cute alien with its big eyes and rounded head. But this little green man will play music and light up as he does it. The attractive little speaker has two 3 Watt speakers that bring an impressive sound quality and the Bluetooth connectivity allows you to wirelessly connect to a smart phone, tablet or laptop and stream music from up to 10 meters away. With Aux, USB and micro SD card ports there are plenty of ways to connect to different music players such as MP3s and Stereos. When the music plays this aliens eyes will sparkle and light up thanks to colorful LED lights that change as you play the music. On the top od the speaker are easy to use controls so you can select the input mode, skip tracks adjust the volume and even answer calls if your connected to your Smartphone. When receiving an incoming call the music will be paused and the speaker will read out the caller’s number so you know exactly who’s calling without having to look at your phone. A built in 1200mAh rechargeable battery brings around 4 hours of play time so you can enjoy plenty of entertainment from each charge. Letting you relax and enjoy the party atmosphere this little green man will create. This LED Alien Bluetooth speaker comes with a 12 months warranty, brought to you by the leader in electronic devices as well as wholesale Bluetooth Speakers..